With the endorsement from the CCDC, Rob McCord lis emerging as an early favorite to be the Democrats’ governor nominee. Chester County’s Democrats were the first in the state to endorse the State Treasurer for governor. WEST CHESTER – The Chester County Democratic Committee rallied around job creation, education, and equal pay at its convention Saturday afternoon at Fugett Middle School — and became the first county in the state to endorse Rob McCord for governor, and the only county in Southeast Pennsylvania to make any endorsement in the race. Many party officials and nominees believe that Gov. Tom Corbett’s actions have stifled job growth, hindering Pennsylvania’s efforts to recover from The Great Recession. “Our primary goal is to defeat Tom Corbett,” said CCDC Chair Michele Vaughn. She also said that the party should rally around whoever the Democrats’ candidate is during the general election. Although Democrats’ move to back McCord could have statewide implications, the tightest — and for some most closely watched — race is that for the Coatesville-area 74th State House District, a new district thought to have a strong Democratic advantage in registration. Downingtown Mayor Josh Maxwell and Caln Commissioner Joshua Young are battling for nomination, with Maxwell narrowly winning the party’s endorsement. Vaughn also said that she thinks the political landscape is shifting in favor of the Democrats, which has allowed the party to win traditionally Republican seats in recent years. She cited Kennett Township as an example where Democrats hold a majority for the first time in history. “Since 2006, we have a registration increase of 45%. That’s a clear indication that moderate Republicans are changing to become Democrats, independents are changing to become Democrats, and we’re registering more Democrats as the demographic is shifting,” she said, while also noting that Chester County Democrats have always been socially progressive and fiscally responsible. Of the Democratic gubernatorial candidates, McCord, currently the state treasurer, seems an early favorite, winning the Committee’s endorsement with 59% of the vote over John Hanger, Jo Ellen Litz, Kathleen McGinty, Max Meyers, Congresswoman Allyson Schwartz, and Tom Wolf. 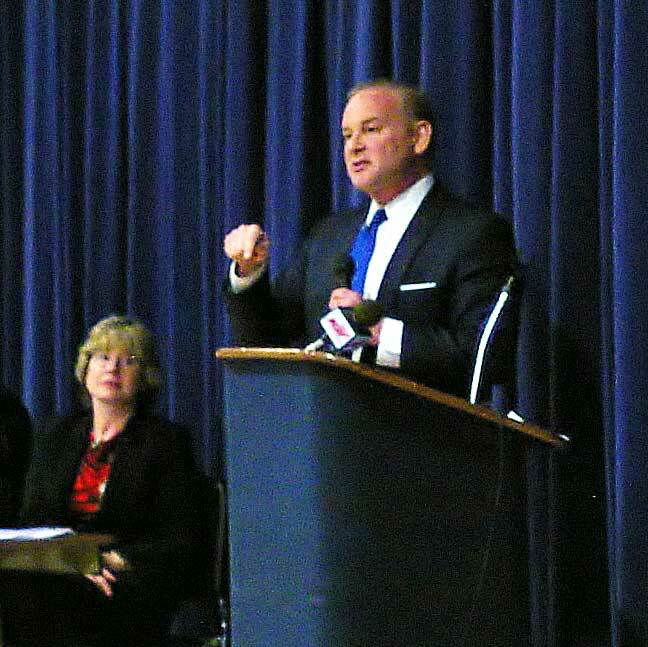 “I am certain I can build consensus and close the sale of job creation and education,” said McCord. McCord, who garnered the Pennsylvania State Education Association endorsement earlier this month, expressed his thankfulness toward the Democrats of Pennsylvania, particularly for their support of public schools. He said that Lower Merion School District saved him from an undiagnosed case of dyslexia. Like many of the other Democratic candidates, he said that he opposes school vouchers, wants to make post-secondary education more affordable, and would like to see charter schools held more responsible for their funding. McCord also mentioned that he is pro-choice and would like to build the state’s infrastructure in order to help grow the economy. Lt. Gov. 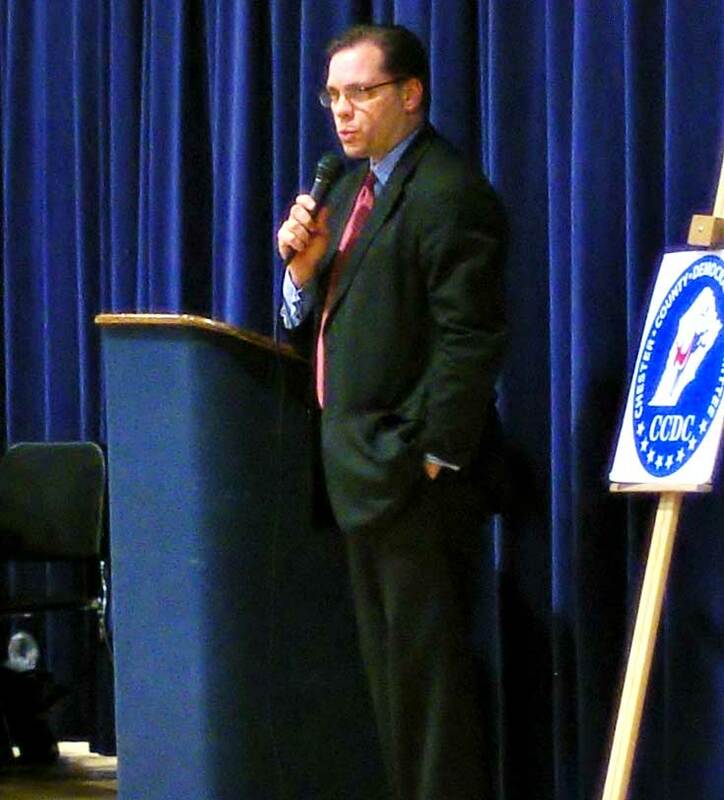 candidate Brad Koplinski speaks to his party before earning their endorsement on Saturday. Whoever occupies the governor’s seat next year, Lt. Gov. 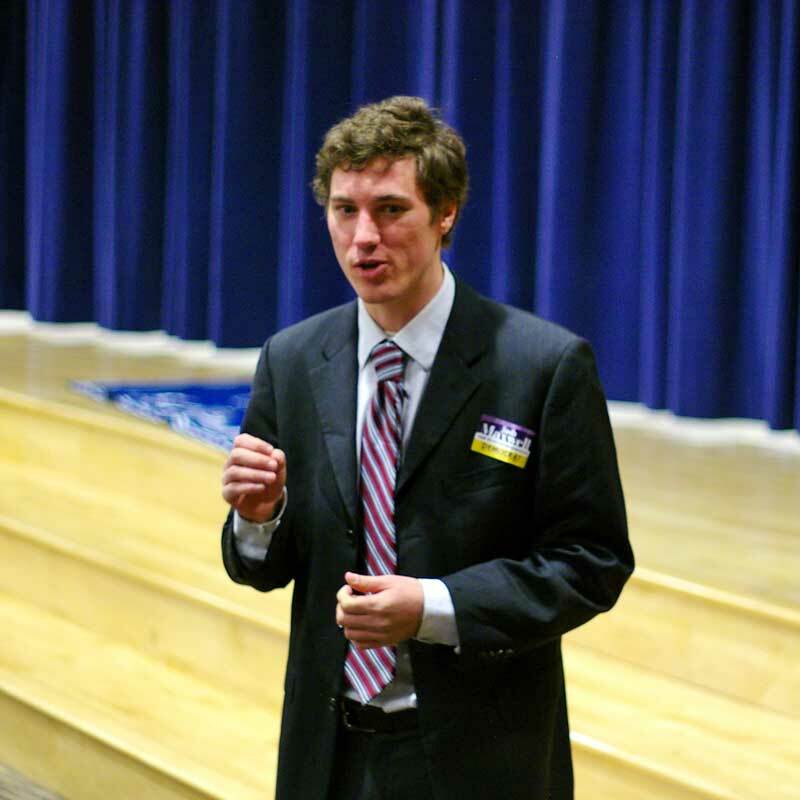 candidate Brad Koplinski hopes to share the office. Koplinski won the party’s endorsement over Brenda Alton, Mark Smith, Jay Paterno, and Michael Stack. Koplinski spoke for workers’ rights, saying that he will push for job creation, a raise in minimum wage, and union rights. “We need to stand up for our working brothers and sisters in unions,” he said. “We need to find out what is in that fracking oil,” he said, noting that Pennsylvania does not receive enough money from fracking profits. Koplinski also defended women’s reproductive rights. While in law school, he defended clinics, and as a Harrisburg City Council member, he pushed for buffer zones to be established around clinics. 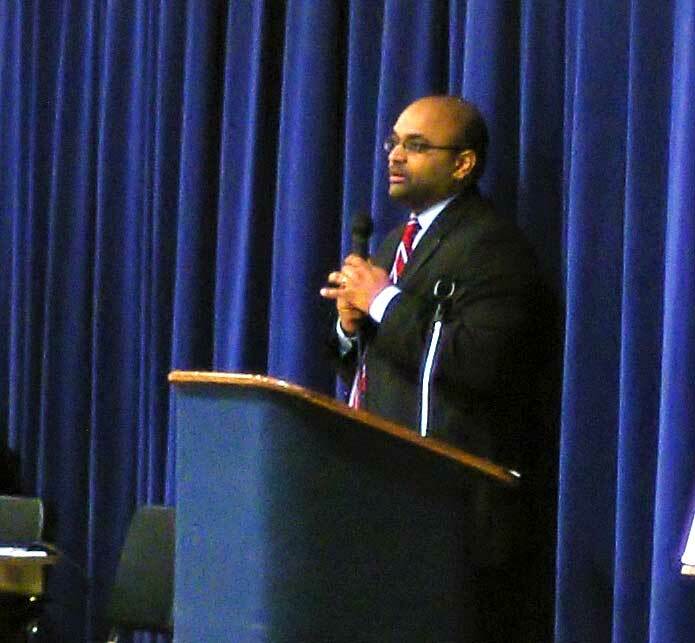 Manan Trivedi earned the CCDC’s endorsement for US Representative in Pennsylvania’s 6th District. In the race for the 6th Congressional District, Manan Trivedi earned the Committee’s endorsement, receiving 74% of the vote over Michael D. Parrish. Trivedi, who ran in the last two elections hopes that Congressman Jim Gerlach’s vacating of his seat will swing the results in his favor this fall. “With Gerlach gone, we’ll get a fair opportunity,” he said. 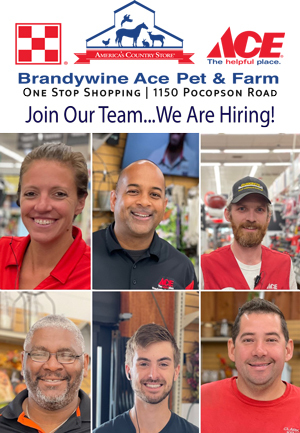 Trivedi said that his top priority is job creation, where he wants the state to invest in small businesses to create sustainable jobs. He also wants women to receive equal pay for those jobs. Another high priority item for Trivedi is public education. Trivedi said that his father moved to the US from India partially because of the US’s quality of education. He stressed that investing in public schools is investing in the country’s future. “If you want to know what your economy is going to look like 25 years from now, the easiet way is too look at your education,” he said. Trivedi said that watching his daughter fall as she learned how to walk helped give him the impetus to run again. In the uncontested bids for nomination, Mary Ellen Balchunis earned endorsement in the 7th Congressional District and Tom Houghton in the 16th. In the State Senate, John Kane went uncontested in the 26th District and Kathi Cozzone in the 44th. Both Kane and Cozzone emphasized job creation and education. Cozzone said that as a County Commissioner, she increased programs for the unemployed and won a Leon H. Sullivan Award from the Chester County Opportunities Industrialization Center. Kane, a hobbyist boxer, said that he is not afraid of a fight and attacked Republicans’ education cuts across the state. “When you start increasing your class sizes and cutting aides, who loses out? Our children,” he said. In the uncontested nominations for the Pennsylvania House of Representatives, Sandra Snyder won endorsement in the 156th District, Marian Moskowitz in the 157th, Susan F. Rzucidlo in the 158th, and Anne Crowley in the 167th. But it was the battle for 74th endorsement that drove much passion and no small amount of time to settle — as the two candidates slug it out in what is expected to be a close primary. Maxwell, who can boast of endorsements from State Sen. Andy Dinniman and County Commissioner Kathi Cozzone, edged out Young by a count of 22-15 votes, just clearing the hurdle for endorsement by two votes. Maxwell, who wants to focus on education and property tax reform, said that he hopes the campaign for the upcoming primary will get people involved in the community. “We have an opportunity to do great things for the people of Chester County,” he said. Downingtown Mayor Josh Maxwell speaks to the 74th State House District in his bid for representative. Maxwell’s campaign spokesperson, Eddy Foster, said that even though the Downingtown Mayor has won the endorsement, they will continue to focus on the same issues, working for the middle class, growing the tax base, and providing funding for education. Young also said that even in the face of Saturday’s result, he will continue to run the same campaign he has been running. “I’m running on the same platform that I did, reforming education and funding it better, helping our working people, and making a better Pennsylvania as well as Coatesville and Downingtown region,” he said. Young also said that he hopes that his coming from Coatesville will push people to vote for him in the primaries as well as give Republican Candidate Harry Lewis competition come November. The back story is this- Michele Vaughn changed the date of the convention to Sat from the prior week. She did that because McCord could not attend during the week, while other Gov candidates could. Having the convention on Sat gave McCord a solo event while other candidates couldn’t make it. Nice fix huh?